Please accept my delayed “Welcome Back” to school letter. After our welcome back celebration Monday, a week ago for staff, and this past Monday for students, I jumped into the preparation of our biennial Legislative Appropriation Request (LAR) and have just now come up for air! I must say it feels wonderful to have all of you and our students back on campus! Trust and Transparency in our work. Although safety has always been of upmost concern, we have made it our number one priority this year and you will notice some of our procedures and routines have changed. TSD will implement its first ever truly locked campus. This school year, beginning on the first day, all school building doors were locked during instructional hours. We will also be working in collaboration with our School Safety Committee in implementing a number of safety initiatives. 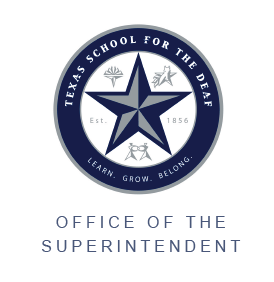 In our budget request to the legislature we have included a number of funding requests including additional security cameras, both internally and externally, locks on interior doors, the installation of an electronic door monitoring system to assist with ensuring only identified persons with a purpose are visiting our classrooms and walking in the hall of our schools. We will also be conducting a lot more drills and training sessions for students and staff. Our goal is to make the safety procedures implemented a part of our daily routines. Every new year brings a host of new possibilities. For our students it’s a time to start over, to make new friends and to reconnect with old ones; a time to build on relationships and on previous learning. We value this time and welcome our new students and families to TSD. This is going to be a great year as we continue to meet the needs of students and to create a place where they can thrive. For the staff and myself it is a time to frame our work around three big questions—is each student learning what he/she is supposed to learn, is each student learning at the appropriate level, and at what level are they engaged? We will depend on you to help us know how we are doing along the way. We have a busy and exciting year before us! Thank you for the privilege of serving your family, your children, and our community.